The MCS Satellite is the heart of the MyConnection Server network qualification solution. The purpose of an MCS satellite is to establish a Test Edge Point (TEP) in a network. Satellites deliver server and client services which propagates the MCS Automated Test Framework (ATF) between two or more TEPs. Any number of satellites can be deployed throughout a network (LAN or WAN) in order to establish well-defined network application segments across any size of network. The MCS automated test framework delivers the ability to consistently measure important application segments defined by TEPs. This approach allows a baseline assessment be created for a corporate network or even a remote customer network. By allowing multiple network segments to be assessed variances within the baseline help to pro actively resolve network problems before they affect the user. Any MCS satellite provides 3 distinct service roles to the overall MyConnection Server architecture. This role delivers a centrally managed automated testing framework on all client platforms, mobile devices and desktops. Automated testing is provided to allow a test profile(s) to be repeated on an interval basis to one or more destinations in order to establish a more though assessment of any network segment(s) that support critical business applications. This includes last mile customer networks for cloud applications. Automated testing satellites are a valuable part of the MCS architecture because it delivers a solution to underwrite a successful application roll-out or provide an accurate insight to cloud application performance. 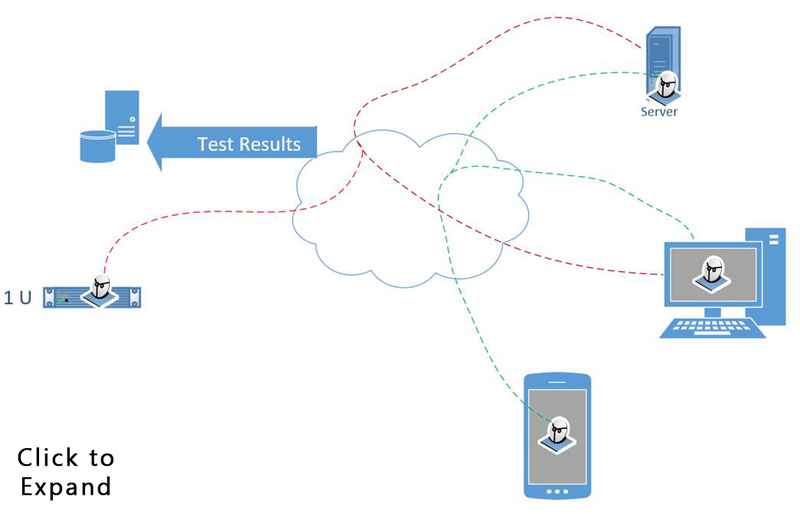 The Agent Satellite architecture is also supported in the MCS development SDK allowing customers to develop automated testing solutions within third party applications or even devices such as router, switches and phone handsets. 2. Server Application. This role comes in two parts. Fig1. Any MCS Satellite can take on the agent or server roles. Part 1 is part of the Agent Application role. When an MCS satellite is running as an agent then the satellite is conducting the test processes. The location in the network where the agent satellite is installed defines the start point of the test and the location of Server Satellite defines the terminating point(s) for test process. It is important to note that all MCS Satellites support both Agent and Server application roles. This means that satellite 'A' can test to Satellite 'B' and vice versa. Fig 1, to the right, shows client/server devices testing to one or more locations across a network including client-to-client and server-to-server. Part 2 of the satellite server role allows the satellite to provide support for running tests in a client browser. In this mode any remote user granted access to the satellite servers can load self-help tests directly to a standard desktop client, Windows, MAC or Linux. This approach allows MCS to deliver user-self-help testing services directly to customer desktops from multiple network segments throughout an enterprise network, different cities, countries etc., with low deployment costs, centrally managed from a single MCS server providing a central reporting point of presence. Fig 2. Satellite Servers running user-self-help-tests to a browser. MCS also support the concept of browser satellites. A browser satellite allows any remote desktop to initiate a user-self-help test from the local browser, which reports directly in the local browser but is actually running the test process directly at the location of the browser satellite. In the diagram above the user at 'c' can run a test A-to-C, B-to-C and if a browser satellite is enabled also B-to-A or A-to-B. This role is primarily for use on smart phones which are more 'APP' centric than browser centric. Phone and tablet Apps deliver a more intuitive, flexible and focused application to what a generic browser can deliver. Also where the browser has security concerns Apps are generally far more secure. 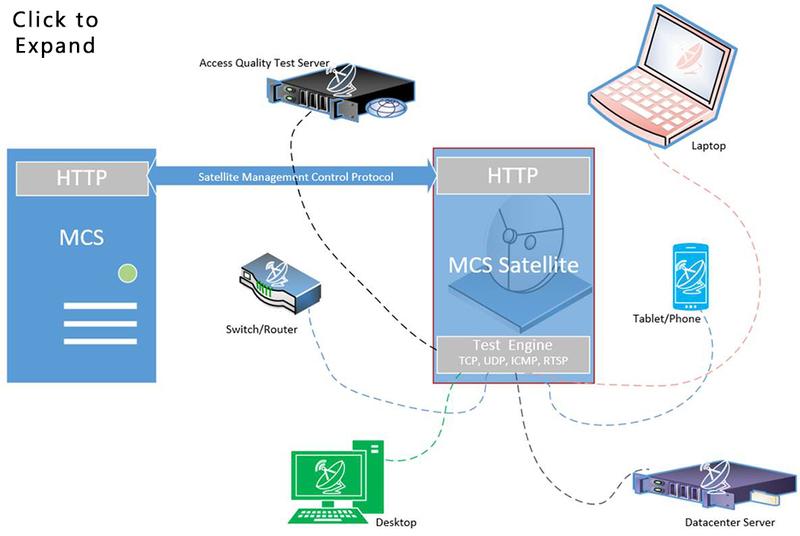 MCS provides a full client SDK to allow licensed customers to develop their own 'client' satellite testing APP, the testing functionality of which is within the full control of the application developer. All platforms are supported including Windows, MAC and Linux. Any MCS satellite object is managed centrally from the MCS Server using the Satellite Management Control Protocol (SMCP). Keep in mind that any satellite can be a Server, Agent or Client at the same time. The SMCP uses only HTTP so satellites can be quickly deployed throughout any size of network and extended or changed simply with few resources. This includes the unique MCS Access Quality performance appliances as well as third party devices such as router, switches and Firewalls. In the diagram below the central MCS Satellite image depicts anyone of the surrounding platform types. The simplicity of the SMCP allows any satellite test engine to test to any satellite test engine if permitted to do so.